How do I wear the Gear S3 correctly? insert the pin into an adjustment hole, and then secure the buckle to close it. Do not bend the strap excessively. Doing so may damage the Gear. To measure your heart rate more accurately with the Gear, wear the Gear firmly around your lower arm just above the wrist. 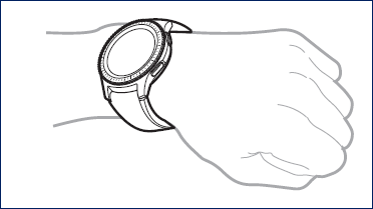 When measuring your heart rate, wear the Gear snugly on your arm above your wrist. Do not fasten the Gear too tightly. 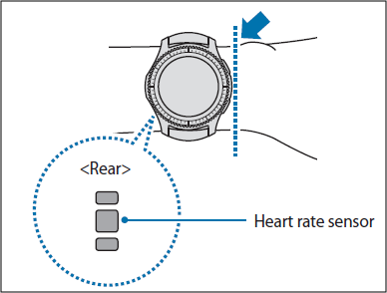 • Take heart rate measurements when you are seated and relaxed. Do not move your body while taking heart rate measurements. Doing so may cause your heart rate to be recorded inaccurately. In addition, if your heart rate is extremely high or low, measurements may be inaccurate.